TALLAHASSEE, Fla. – With college football’s awards circuit finished and All-American lists revealed, No. 11 Florida State’s Orange Bowl date with No. 6 Michigan now sits just two weeks away. With that in mind, the Seminoles returned to the practice fields Thursday night, where they’ve already begun to implement their game plan for the Wolverines. FSU coach Jimbo Fisher said that the team treated Thursday’s practice as an extended “Monday” session. The Seminoles will hold five more practices in Tallahassee before breaking for a few days and re-convening in South Florida on Dec. 24. Fisher was effusive in his praise for the Wolverines, who boast one of the nation’s best defenses and who were an overtime loss to Ohio State away from potentially playing in the College Football Playoff. The Orange Bowl figures to be a matchup of strength against strength: Florida State junior running back Dalvin Cook, named a unanimous All-American on Thursday, against a Michigan run defense that allows just 3.14 yards per carry. And Michigan’s pass rush and secondary might be even better. The Wolverines rank fourth in the country with 44.0 sacks – behind only the Seminoles, Alabama and Clemson – and their 135.9 passing yards allowed per game are the fewest in the country. “They play hard. They’re extremely well coached,” Fisher said. “Their front is really good and they have depth. They can play the run and the pass, some (teams) play one better than the other. They play both equally well. Fisher said he expects the Seminoles to be mostly healthy for the Orange Bowl, with one key exception: sophomore safety Derwin James will not play. James tore his meniscus in Week 2 against Charleston Southern, and while Fisher hoped that he could return later in the season, those hopes never materialized. Freshman quarterback Malik Henry will transfer after one year at Florida State, Fisher confirmed on Thursday. One of the most sought-after prospects for the recruiting class of 2016, Henry redshirted after a promising performance at the Garnet and Gold Game in April. Henry, a California native, was suspended for undisclosed reasons in August but later returned midway through the season. Henry’s departure should clear a path for J.J. Cosentino and Jake Rizzo to challenge for the top reserve spot behind Deondre Francois come spring. Fifth-year senior Sean Maguire will close his FSU career at the Orange Bowl. Fisher said that starting right guard Wilson Bell will play in the Orange Bowl after receiving internal discipline for an off-field issue. Bell has 18 career starts at right guard, including each of FSU’s last four games. “It was a mistake which he made,” Fisher said. “We don’t look at it as anything minor, but it was nothing he did intentionally. With a series of high-profile hires in recent weeks, the coaching roster in the state of Florida has received a major boost in profile. Florida International got the ball rolling by hiring former Miami coach Butch Davis last month. Then, this week, South Florida hired former Texas coach Charlie Strong and Florida Atlantic brought on former Tennessee and Southern California coach Lane Kiffin. Between those three hires – along with the “big three” of Fisher, Miami’s Mark Richt and Florida’s Jim McElwain – there may not be another state in the country with a more competitive lineup of head coaches. Fisher has another unique stastical quirk in his favor: Each of the state’s seven FBS coaches have been a part of a national championship team as either a player or coach. 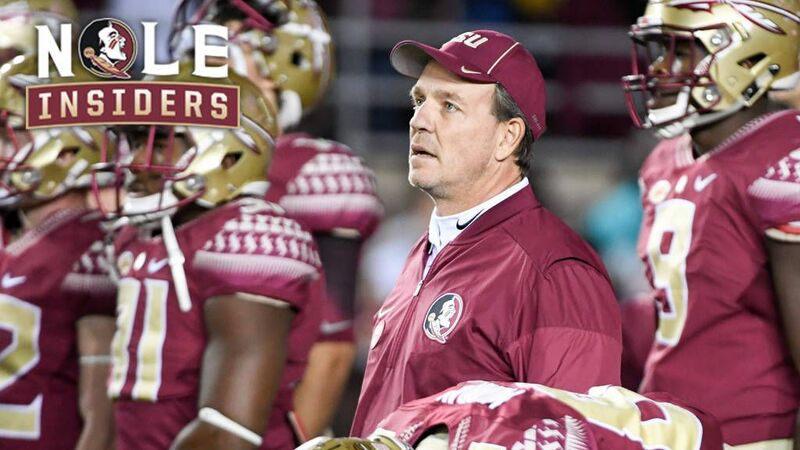 But Fisher is the only one to lead his team to a national title as head coach, having guided the Seminoles to an undefeated, championship season in 2013.